I’m in love…with a variety of narcissi which had not really come to my attention until this week. It’s name is Erlicheer and the ones featured in today’s blog post were grown in the Scilly Isles by Matthew Rogers of J R Stideford and Son, who very kindly sent me some. 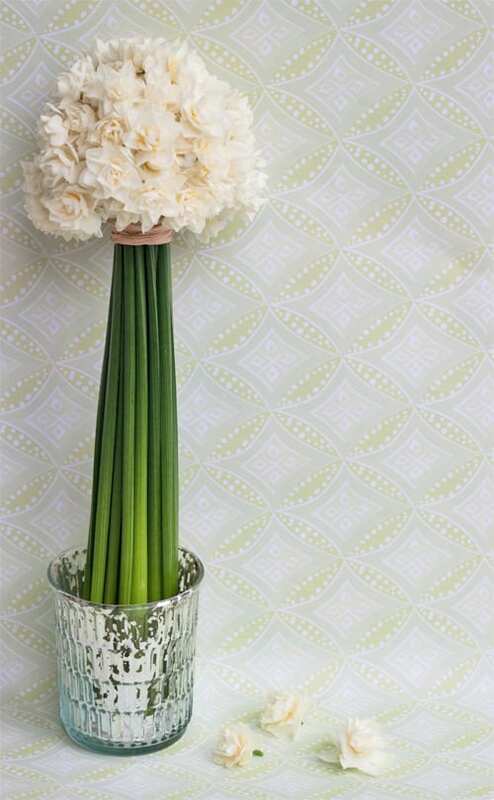 Narcissus Erlicheer is a highly scented double headed white narcissi, with multiple florets on each flower head. And their double heads make them look like beautiful miniature roses. I made this very simple ‘topiary tree’ below, by gathering the stems together to create a dome-shape with the flower heads. Then, I secured the stems with raffia, cut them to the appropriate length and placed them in the container. An alternative to raffia is ribbon or string. To keep the narcissi in place, put some moss, bubble wrap or cellophane into the container. Then, simply add water. Three of these designs down the centre of a table would look so lovely! And these gorgeous flowers would also make a wonderful British grown alternative to red roses on Valentine’s Day…especially for ladies who love scented blooms. 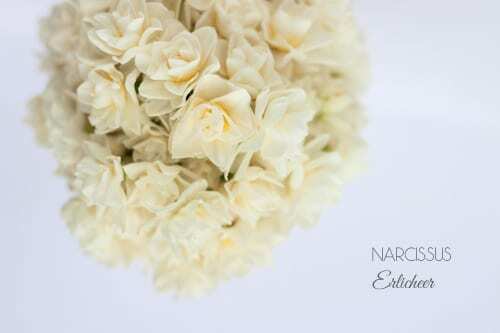 The fragrance of the Narcissus Erlicheer is described as sweet, vanilla custard! These are a beautiful variety indeed.